A state-of-the-art farmstead creamery sets out to craft world-class renditions of legendary French cheeses from the hills beyond Northport in Leelanau County. Featured in the April 2014 issue of Traverse, Northern Michigan’s Magazine. On April mornings the pastures and woodlands at Idyll Farms come to life after a long cold dormancy. Cherry, apple and quince buds swell in the orchards. Wild leeks push up through the leaves. The white scrim of winter still clinging at the hillsides is interrupted by a green stubble of new grass, and everywhere there are goats. Seventy does and four bucks. A mixed herd of Alpines and Saanens wandering and foraging, nibbling on nutrient-charged shoots to enrich the milk that feeds their newborn kids and supplies Idyll Farms’ state-of-the-art creamery with the foundation ingredient of artisanal goat cheeses. Informed by Old World aesthetics and driven by a passion for full-circle sustainable agriculture, Idyll Farms, in its second year of operation, is a bright spot in Leelanau County’s burgeoning artisan farm culture. 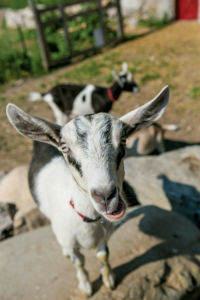 We join Idyll Farms owners Mark and Amy Spitznagel to explore the genesis, design and daily rituals of farming and cheesemaking at their goat utopia on Northport’s Peterson Park Road. Historically a dairy farm, Idyll Farms encompasses 200 acres, culminating in a bluff overlooking Northport Bay and anchored by a 19th-century barn of weathered wood and local stone. “We see the barn as our connection to the history of this place and wanted to grow our farm organically around that,” Mark says. The structures that emerged from that vision were informed by Old World masonry seen in Amy’s travels in the Alps and Pyrénées, and realized by renowned restoration architect Kelly Sutherlin McLeod of Long Beach, California. He used huge stones excavated from the property to build the facade of the cheese aging caves, where precisely controlled humidification allows the farm’s washed and bloomy rind cheeses to develop a nutty depth of flavor that has local chefs and foodies scrambling for every pound. Idyll's custom hillside aging caves. Two inquisitive kids at Idyll. Herder knowledge is especially valuable in April, during the busy spring kidding season, as Tinkerbelle, Amelie, Escapade and nearly 70 other does are finishing up a monthlong, around-the-clock birthing ritual that brings Idyll’s next generation of Alpines into the world. “There are a lot of kids jumping around this time of year,” Amy says of the 100 or so fuzzy, four-legged infants expected to be bouncing through the barns this spring. Herdsmen Will Manty, Gaia Nesvacil and Melissa Hiles, along with consultants and seasonal staff, attend the loosely controlled chaos of birthing, bottle-feeding, milking and corralling the animals, while master cheesemaker Madeleine Vedel presides over the science of curds and whey. She is the one who adds rennet to the rich spring milk to build the foundation of bloomy goat camembert, creamy crottin and the washed rind tommes that will age in caves over the summer. To that end, the Spitznagels and their crew have organically cultivated the property’s flora to offer a broad spectrum of nutrients for the goats. Legumes, grasses and fruit trees dot the rolling pastureland. Chickens clean up parasitic insects and fertilize the soil. The farm’s pigs are fed whey from the creamery and run under the orchards. Garden plots grow vegetables and medicinal herbs for the goats. As the cheese program develops, so too does the produce. Organically grown quince and chestnut trees supply classic accoutrements for cheese tasting. “We like to think we’re milking the whole farm,” Amy says. This terroir-driven approach to cheesemaking follows the arc of the goats’ diet from spring through fall, with the best cheeses produced later in the year following a surge of nutrients as the mother goats wean their kids. In the heat of summer, when the goats are feasting on grass and drinking lots of water, the milk has lower fat content and higher acidity, making it perfect for the fresh lactic chèvres that can go from udder to hors d’oeuvres in a few short days. Up along the bluff at Idyll Farms, as the April sun sets, evening milking will commence amid a cacophony of bleats from curious goats and their kids. Amy Spitznagel will help shuttle does in and out of the 24-stand milking parlor, where humming pneumatic pumps extract rich milk, a distillate of early spring in Leelanau County, to be set, strained and molded into delicious logs, disks and creamy spreads savored on dining tables all around the North. Devoid of lactose and lower in fat than cow’s milk, goat’s milk makes for some of the world’s finest fromage. Baguette in hand, we explore the styles made at the Idyll Farms Creamery. Lactic: The style known as fromage blanc or fromage frais, these fresh unpressed cheeses rely on the goat milk’s natural lactic acid to coagulate and retain higher water content and acidity, making them moist, bright and perfect for spreads. Bloomy Rind: This style of traditional French chèvre is formed into button-shaped crottins or rolled into logs ripened with surface mold that changes the inner texture of the cheese as it develops. Young bloomy rinds are smooth and dense, becoming creamier and more flavorful with age. Idyll’s goat camembert and double creme also fall into this category. Serve with salads, honey or crusty bread. Washed Rind: Serious cheese for serious cheese lovers, the pungent washed rind cheeses are bathed with either brine (Idyll’s Inspiration) or with booze (Idyll’s Jubilation is washed with L. Mawby Crémant and Temptation with Tandem Cider). Washing enables the growth of B. linens (Brevibacterium linens), the bacteria that gives these cheeses their signature scent. Nutty, semi-soft and profoundly flavorful, washed cheeses are best served with quince paste, roasted nuts and hard cider.